Days before my international speaking debut in Barcelona, Spain, I started to feel my jaw tighten and my neck get more stiff. I was sleeping less than desired because I wanted to work on my presentation. I realized I was getting the early indicators of not taking care of myself. I had fallen off my yoga and meditation wagon more than usual. Every time I start to get these physical indicators of stress and tension, I turn to yoga and meditation to help me get back to a healthy state of mind–and body. It didn’t take me long to realize I needed to re-focus and remember that the number one priority of this trip (and family vacation) was to take care of myself so that we would all go on this trip and stay healthy along the way. I have chosen a different path before–ignored my body’s indicators–and regretted it as I sniffled and sneezed through travel dates. One time, my voice was cracking, and I felt miserable for the entire trip. That was before I started paying attention to myself more. I would just suffer through the situation. I realize many of my patients suffer through their pain. Actually, many of us suffer through our pain. It seems like our culture expects a certain amount of grist and wherewithal before being able to wear society’s “successful” medal of honor. Certainly dental school was like this. The desire to graduate led to extreme moments of self-deprivation. I clearly remember not wanting to drink anything so that I would not have to go to the bathroom. Often times, I would work though the lunch hour to finish a case or complete an assignment. The demands were great and my desire to succeed provided the motivation to override any bodily function. I re-trained my body. I learned to mentally over-ride my physical needs. I did not know I was doing this at the time. But, this type of behavior can only last for so long before something gives. One of my classmates tried really hard to over-ride her body’s desire to sleep. She drank heavy amounts of caffeinated beverages and ended up having hallucinations because of her choices. The body always wins. Sometimes it takes years to win, but it always wins. By age thirty-five, my behavior led to shoulder pain and consistent tooth pain from grinding my teeth. I actually had two root canals completed within a two-year span because I kept cracking my teeth–even with regular bite guard usage. I was a bit of a mess. Yet, the overachiever in me refused to see it. I didn’t feel stressed. I blamed my large fillings as a child for the reason my teeth cracked, and I blamed my weight lifting for the shoulder pain. It never really came to me that it could be my behavior that was the problem because, honestly, it felt like I was less stressed than I was in dental school or in other time periods in my life. So, I ignored the problem some more until the shoulder pain finally became so intense I could not enjoy my days at work. I relented to the advice of my massage therapist, and I tried yoga–a fast paced style at first–that actually gave me a great workout and helped me learn to calm my brain simultaneously. There are few places to go to totally let your guard down and revel in a non-fight or flight mode. Many people tell me they golf or run or bowl to help them relax. And, they often follow that up with what their score was and how they almost attained their personal best performance. So, I know they did not get to the level of relaxation that comes from a mind slowing activity like yoga. There’s no competition. It’s a rare find. As a matter of fact, one key principle in yoga is to learn to have no judgements of others. Try that if you never have. It’s hard. I will just say that. It’s hard because all of our lives we have been taught to compare ourselves to others. We have been taught to be unsatisfied with what is happening right now, and the achievers in us want to be better, do better, and look better constantly. Not in yoga. Yoga teaches us to accept ourselves where we are right now. It removes the competition; it is mind-blowingly refreshing. I think that is why it is gaining so much popularity. People are burning out on competition and stressful lifestyles. It’s an antidote to our chaotic lifestyles. Don’t worry, though, this doesn’t mean we can’t be competitive. We can. I am–just not 24/7. We need the opposite of our competitive environments to create homeostasis within our bodies. Interestingly, I find many men hesitate to try yoga. I think it’s because they don’t understand what it is. And, perhaps a bit concerned about letting down their guard too much. It could make them “soft.” I had similar concerns. It always seemed kind of…well…weird and “out there.” I never pictured it in my brain. Basketball…yes…Running and lifting weights…yes…but yoga…nope…never even on my radar until into my thirties. And, I realize I was being judgmental of those “weird” types of people who are in to yoga. Now, I am one of those weird people, and yes, I will have to say, I have met some very different people who are not like me, and I have also met many, many people who have helped me balance out my life in ways I never knew possible. My competitiveness remains strong, AND I know how to not be so competitive. There’s a time and a place–and it has to balance out. Otherwise, expect physical injuries. Yo gonna need yoga sometime. You might be tempted to try something else first…like a stiff drink or a new car. But, when you are really ready to calm down, and when you are really ready to listen to your body’s needs, I recommend a few down dogs and lessons from a true yogi. 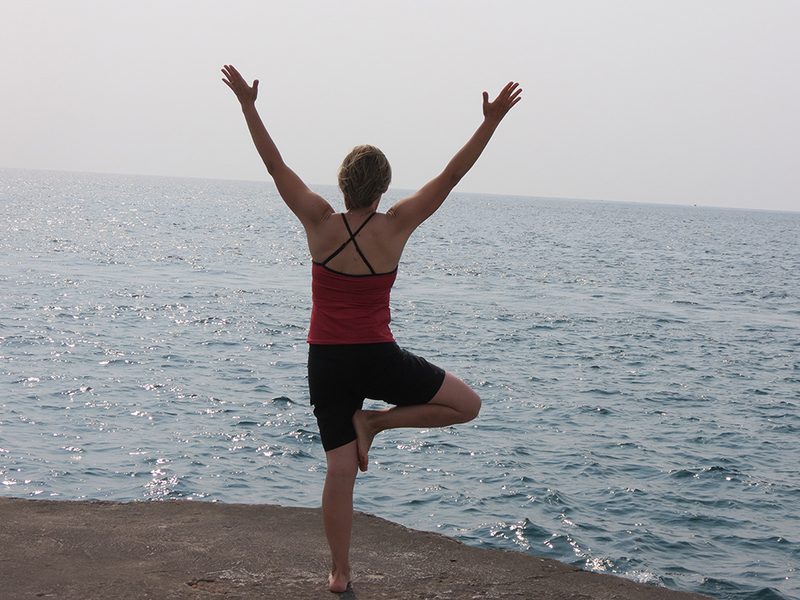 Once the postures in yoga are learned, as well as some of the routines, yoga can travel with you anywhere. You need no equipment, and when you realize your body is tensing up, it’s reassuring to know you have a tool in your repertoire to help fix the problem. I often do yoga in my home now (or outside as pictured). However, I still value a lesson or class from a certified instructor to help me improve my knowledge and to help me connect with like-minded thinkers. Yo gonna need yoga. And, then, when you master that…try meditation. It’s even more clarifying than yoga. We will get to that topic in the future. Namaste (that broadly means, “all the light and love in me honors all the light and love in you.”) No judgements here. Peace. And find a yogi if you have not already.